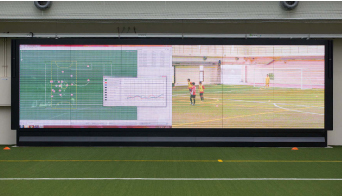 Two large monitors (8×2.2 m, 4×2.2 m) inside the arena display data recordings and video imagery captured with the cameras. Due to their size, brightness, and excellent clarity, the monitors can also be used for experiments that involve displaying life-size video images of athletes. 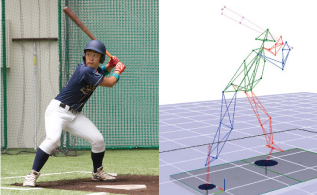 In being able to display video captured with high speed cameras or motion capture in slow motion on the large monitors, coaches can provide useful feedback for athletes through measurement and examination of each pitching or batting. 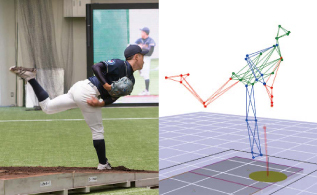 Using the monitors to display data gathered via the Object Tracking System, athletes are also able to understand their positioning in play, allowing both athletes and coaches to discuss the correctness of their positioning. 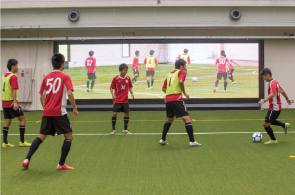 In addition, athletes’ heart rate can be checked on the monitors while they are in play.